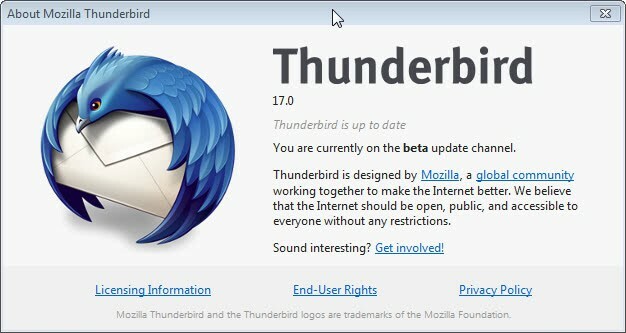 Thunderbird 17.0 is the last release of the email client before Mozilla's de-prioritization of the client takes effect. What this means is that Mozilla is assigning engineers that maintained various Thunderbird related positions, like feature development, code review or marketing and engagement, to other projects. The gaps are filled by contributors which worked side by side with Mozilla in some areas. Thunderbird 17 will be an ESR, an extended support release, which means that coming versions will be released as 17.0.1, 17.0.2 and so on and not Thunderbird 18, 19 or 20. The next big version update will then be released at the end of 2013 when Thunderbird's version will be moved to 24 to fall in line with the Firefox browser. Definitely not the big bang that Thunderbird users may have hoped the last release would be. New users see the single menu button that is already known from Firefox, while Thunderbird will display the menu bar for old users by default. Tabs are now also shown in the title bar which saves some space in Thunderbird. Several minor changes have not been listed in the release notes. 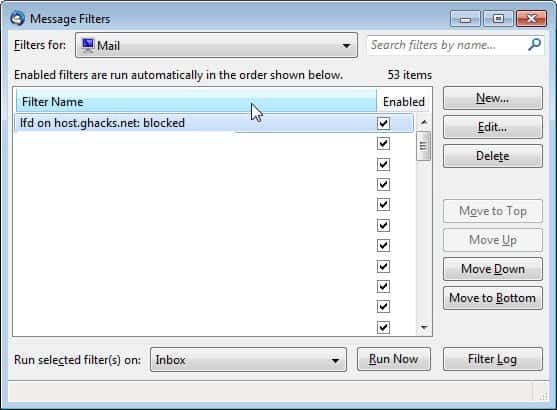 The Message Filters dialog comes with a search now which makes it easier to find filters in the manager especially if lots of filters are configured. Another change is the option to automatically display the attachment pane when you open emails in Thunderbird that contain attachments. A right-click on the attachment pane and the selection of Initially show attachment pane enables and disables the feature in the client. 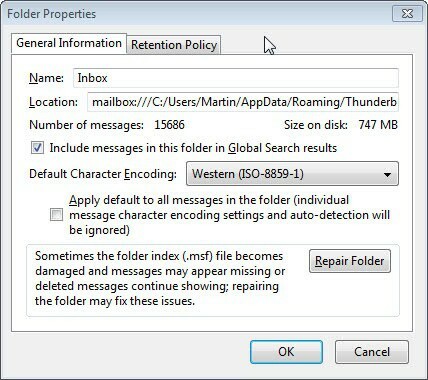 A right-click on a mailbox and the selection of properties displays information about the number of messages and the site of the messages on the hard drive. Mozilla has improved support for Google Mail addresses by implementing support for Google's XLIST, X-GM-MSGID, X-GM-THRID and X-GM-LABELS. You may also notice improvements when copying, moving or deleting messages in the client.